We went to Jersey Mike’s Subs for today’s portrait, held tight like a prized possession by guest portraiteer James O’Meara. 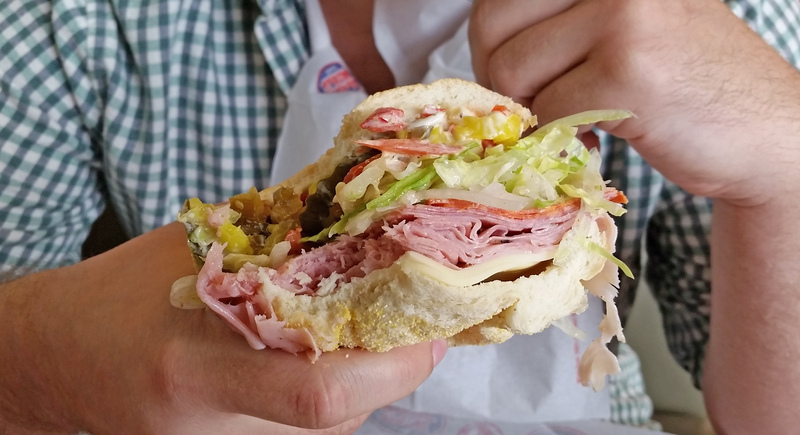 Upon entering, the order was simple: “The Original Italian with everything but olives.” Jersey Mike’s doesn’t have olives! So they piled on all the fixins bringing the total ingredients to provolone, ham, prosciuttini, cappacuolo, salami, pepperoni, lettuce, tomato, onion, peppers, red wine oil and vinegar, and seasoning to boot. The result weighed as much as a newborn baby and was gone within the hour. James left offering compliments to, in this case, the sandwich architects. Outside, it began to rain, as if the heavens wept joyful tears on James’s behalf.